The departure last year of keyboard player Jan Krause has not affected the ability of the line up of Gordon Bicknell on Guitar, Mark Bodossian on Bass, Greg Chandler on Guitar and Vocals, Joe Fletcher on Drums, and Jim Nolan on Guitar, to crack on with the new album, nor has it stopped them playing live while they search for a replacement. 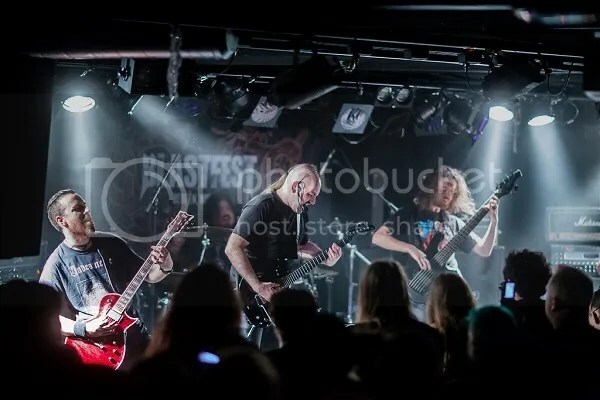 With an appearance at Bergen’s Blastfest already behind them, other confirmed dates include a show at The Boston Music Room in London along with AHAB on the 4th of July, and the 20th Anniversary celebration of Brutal Assault Festival in the Czech Republic in August. As well as the new album, ESOTERIC also have other releases on their mind, which vinyl fans will definitely appreciate. “We plan to release “The Pernicious Enigma” and “Metamorphogenesis” on vinyl, which are the two remaining albums from our back catalogue that haven’t yet been released in this format. After that we will be re-releasing our first two albums on CD, but we will have more details about everything we’re planning to do as we go along. “The Pernicious Enigma” has actually been transferred from the original multitrack tapes, and remixed and remastered at the Priory Recording Studios for the vinyl release. Having never been happy with the original mix of the album, we were able to go over the tracks and bring out some of the details that were buried or subdued in the original release, without changing the overall feel of the album “. And is there any news about a much-requested live album? “It’s definitely something we’ve always had in the back of our minds, but it’s not a question we can give a definitive answer to right now”, commented the band. “It’s true that we recorded the show in Brescia,Italy, in January, but finding the time to work on it is going to be very hard, especially with a new studio album in the offing. We will try to find the time to mix the live recording in the coming months and then we will look at the possibility of a release”. Reblogged this on Renaissance of the Vast Black Sea.